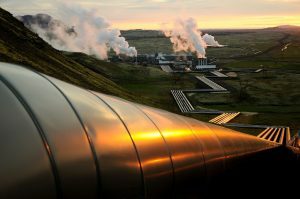 Geothermal Research Cluster (GEORG) and a group of 17 partners across Europe have received a EUR 16 Million grant from the Horizon 2020 Research and Innovation programme. The funding contributes to the GECO project, GECO standing for “Geothermal Emission COntrol”. The project will advance the provision of cleaner and cost-effective geothermal energy across Europe and the World with reduced emissions of carbon and sulphur. The core of this project is the application of an innovative technology, recently developed and successfully demonstrated at a pilot-scale in Iceland, which can limit the emissions from geothermal plants by condensing and re-injecting gases in the subsurface, or turning them into commercial products. GECO aims to increase public acceptance and generalise this novel approach. To that end, the re-injection method will be applied in four distinct geothermal systems in four European countries: 1) a high temperature basaltic reservoir in Iceland; 2) a high temperature gneiss reservoir in Italy; 3) a high temperature volcano-clastic reservoir in Turkey; and 4) a low temperature sedimentary reservoir in Germany. Within GECO, gas capture and purification methods will be advanced by lowering consumption of resources (electricity, water and chemicals) to deliver cheaper usable CO2 streams as commodity to third parties. GECO’s unique approach consists of capturing the waste gases, dissolving them in the exhaust geothermal water stream, and re-injecting the aqueous solution. The re-injected acidic gas-charged fluid provokes the dissolution of subsurface rocks, which increases the reservoir permeability, and promotes the fixation of the dissolved gases by mineralization. The waste gases are therefore stored in the long term, in an environmentally friendly manner, while geothermal emissions are cost-effectively cleaned compared to standard industry solutions. A detailed and consistent monitoring program, geochemical analysis, and comprehensive modelling will characterise the reactivity and consequences of fluid-flow in the geologically diverse field sites of GECO. This will create new and more accurate modelling tools to predict the reactions that occur in the subsurface in response to induced fluid-flow, and favour the scalability of gas capture and purification. Finally, gas capture for reuse will be demonstrated by producing a CO2 stream with only trace H2S levels. This prerequisite for most utilisation pathways will be demonstrated as part of the GECO project. GECO aims to develop near Zero Emission Geothermal power plants. 9 Countries: France, Germany, Iceland, Italy, Norway, Spain, The Netherlands, Turkey, United Kingdom. Project duration: 5 years, 95 annual work units.